Features: Save time on snow and ice removal. 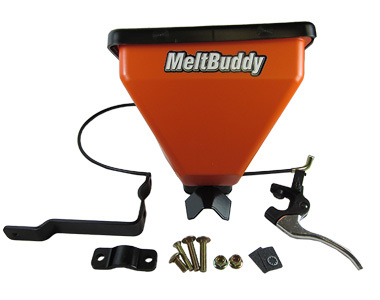 With the Melt Buddy mounted to your snow thrower you can clear snow and spread ice melt in a single pass. The easy-to-use hand trigger and large capacity hopper allow you to drop ice-melt granules only where needed. Ask us about the Ariens Melt Buddy Salt Spreader. Please no repair questions. Your Q&A may be posted to SnowblowersAtJacks.com to help other shoppers, like you, with their purchasing decisions. Thank you. Will it attache to any snowblower I own a husqvarna. Arun, yes this salt spreader will fit your model. Angela, it does not hold an exuberant amount of salt and you must use a finer salt - nothing too chunky or big or it can either clog/not drop and if adding too much salt it may prohibit your snowblower from performing well. This is a great spreader for small areas that may not need a ton of salt or something to just keep up with the impeding ice and snow. Definitely suggest if you just would like to use for a short driveway or sidewalk. Keep a bottle with funnel available - it is a great way to help adding salt.